Global health is a broad field, encompassing many disciplines and perspectives. But I find one thing that unites this diverse community is an uncommon commitment to impact. We believe the true measure of our success is always the positive effect we have on the communities with whom we work. For that reason, I’m pleased to share with you the Duke Global Health Institute’s 2017-18 Impact Report, which documents the demonstrable impact DGHI faculty, staff, students, and partners have made in the past year. How a diverse team of faculty and students are coming together to address global health challenges in our own backyard. These are just a few of the examples that make this report an inspiring read. I hope you share my enthusiasm for the work DGHI is doing around the world – and thank you to all of you who are helping to make these impacts possible through your support of the institute and its missions. 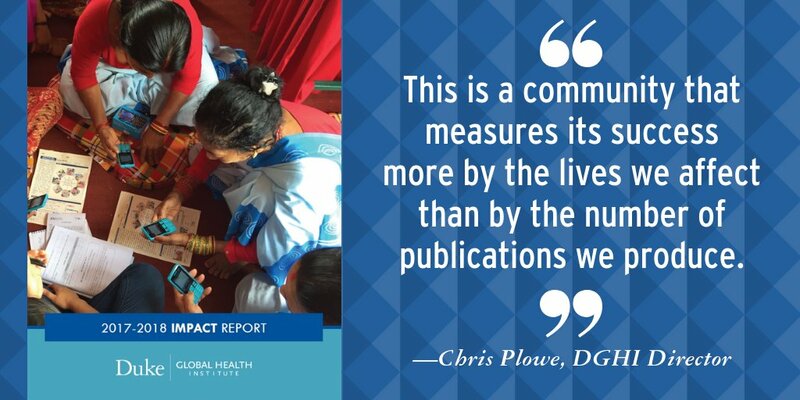 Read the Duke Global Health Institute’s 2017-18 Impact Report.